Trotskyist, amanuensis to Elliott Carter, bon viveur, Renaissance man, friend of W.H. Auden, trailblazer for racial equality and early music pioneer - those were just some of the personas of Noah Greenberg who died on January 9th 1966 at the age of 46 after suffering a heart attrack. 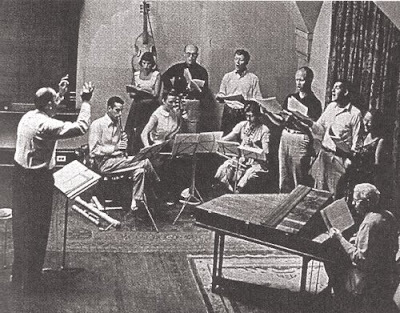 Today Noah Greenberg is remembered as the founder of the legendary New York Pro Musica and he is seen directing the ensemble in the accompanying photos. A self-taught musician, he formed Pro Musica in 1952 to explore the then unknown medieval and Renaissance repertoire. The photo below shows his 1958 staging of the 11th century liturgical drama The Play of Daniel at the medieval branch of New York’s Metropolitan Museum of Art known as The Cloisters. This production, which included a narration by Greenberg's friend W.H. Auden, was the tipping point for early music in North America. Later the same year Decca's bestselling LP of Daniel helped tip early music even further towards the mass market and Pro Musica's status as a classical music hot property was confirmed when it signed with Ronald Wilford’s Columbia Artists Management. Born in the Bronx in 1919 to Jewish immigrant parents, Noah Greenberg grew up in a politically aware household and joined the neo-communist American Student Union while at high school. He remained a communist as a young man but moved away from Stalin first to the Trotskyist camp and then on to the small independent Workers Party which attempted to infiltrate the American labour movement in the early years of the Second World War. While working in West Coast shipyards as a machinist Greenberg lost his draft deferment in 1944 and joined the US Merchant Marine as a crew member; his spell as a ship's cook laid the foundation for his later passion for cooking and good food. Greenberg was a lifelong resident of New York and Pro Musica's big break came in 1953 with a residency at the Young Men's and Young Women's Hebrew Association of New York on Ninety-second Street. Greenberg had been studying music since high school and in 1938 put together an informal group of singers to explore early vocal music. After leaving the Merchant Marine in 1949 his focus switched away from politics towards music In 1950 Greenberg went to France with his first wife to attend Pablo Casals' first Prades Festival and on his return formed the embryonic New York Pro Musica. Although Greenberg forsook politics for music his activist path came back to haunt him in 1956 when a US State Department backed Pro Musica tour of Europe was cancelled at the last minute, allegedly because of Greenberg's communist past. However a State Department endorsed tour of The Play of Daniel went ahead in 1960 and Pro Music's establishment status was cemented three years later when the Ford Foundation awarded it a $465,000 grant. But despite the success of Pro Musica Noah Greenberg was more than an early music specialist. In 1950 he was copyist for Elliott Carter while the composer was writing his First String Quartet and Carter gave him access to his personal library of rare editions of Renaissance music. When visiting Paris in 1960 Greenberg met the serial composer Luigi Dallapicola and a performance of Daniel in the same year at Kings Lynn in Norfolk, a few miles from where I write, was attended by Benjamin Britten and Peter Pears, not to mention the Queen Mother! Founder Pro Musica member Russell Oberlin sung the role of Oberon in the premiere of Britten’s Midsummer Night’s Dream at Covent Garden in the same year. 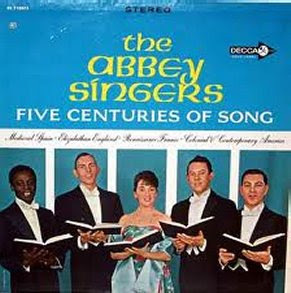 A 1963 Decca LP (see below) with Greenberg conducting the Abbey Singers, a training group for Pro Musica, included Ernst Toch's spoken Geographic Fugue and Copland's I Bought Me a Cat. 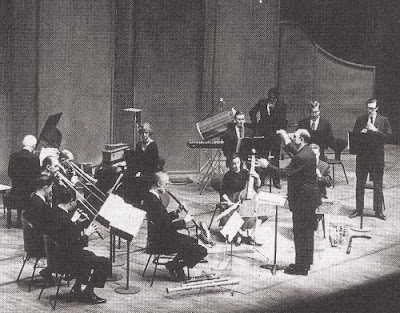 Shortly before his death Noah Greenberg joined John Cage and Merce Cunningham at a soirée organised by Fluxus catalyst Allan Kaprow and there was even a flirtation with nascent world music when Greenberg heard the duduk player Djivan Gasparyan playing when touring with Pro Musica in Armenia in 1964. Another little-known persona is Noah Greenberg the humanitarian. Pro Musica rose to prominence at a time when institutional racism was an accepted feature of American classical music. Despite this musicians of colour featured in the various Pro Musica line-ups. African American bass baritone Marvin Hayes performed with several of Greenberg's ensembles in the early 1960s and can be seen on the cover of the Abbey Singers' Decca disc above. Fellow African American and percussionist Frederick King joined Pro Musica's instrumental group in 1963 and took part in their Russian tour the following year; he is playing with Greenberg's Renaissance Band in the footer photo. In 1963 Greenberg met with James Meredith, the first black student to attend the University of Mississippi, and in 1965 Pro Musica gave a benefit in Greenville SC for the National Association for the Advancement of Colored People. Noah Greenberg's inclusivity was not restricted to ethnicity: founder member of Pro Musica tenor Charles Bressler, back row in white shirt in photo 3 from 1954, was an uncloseted homosexual a decade and a half before the Stonewall Riot. Neglect by the record companies of Noah Greenberg's recorded legacy is another reason why he is not better known. 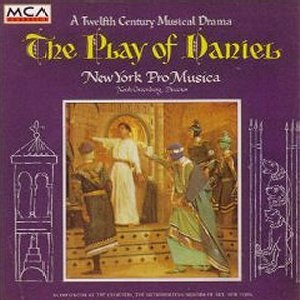 Above is the LP of The Play of Daniel which was a bestseller in 1958. Greenberg made twenty-eight LPs but as I write not one commercial disc by Pro Musica is available. The Play of Daniel was also recorded for National Education Television, but I can find no information on a video release - does the master tape still exist? YouTube is more rewarding and there are two substantial videos of Greenberg and the instrumental Renaissance Band here and here., but alas none with Pro Musica. But there is a ten minute video of the fiftieth anniverary production in The Cloisters which gives a tantalising taste of what took New York by storm in 1958. That barometer of celebrity status Wikipedia has a stub article of just six lines on Noah Greenberg - surely he deserves better than that? Yes, Greenberg was a visionary musician and a notable humanitarian, but he was also much more. 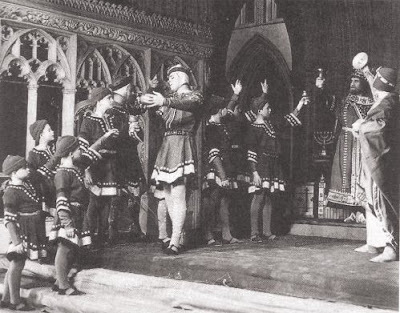 The first run of seven performances of The Play of Daniel in January 1958 at The Cloisters was a sell out. In response to demand three more performances were scheduled in the much larger Riverside Curch and sold out immediately. This meant that in one month a total of 10,000 people paid to see an obscure medieval liturgical drama and a vibrant new audience was created for early music. All in the year when the musical of choice on Broadway was Rodgers and Hammerstein's Flower Drum Song. Surely this tells us something at a time when classical music is struggling to reach new audiences. Twitter and Facebook may have their uses - but what classical music really needs are more Noah Greenbergs. * Pied Piper, the Many Lives of Noah Greenberg by James Gollin (ISBN 1576470415) is a model biography. It is the primary source for this article and I cannot recommend it too highly. But sadly it is out of print, the high prices copies are selling for surely suggests enough demand for a reprint. My thanks go to the Housing Works Bookstore Café on Crosby Street, New York for providing an affordable copy. Terry Teachouts 2001 article draws on James Gollins' book and is also recommended. * Although Pro Music's The Play of Daniel is not available there is an excellent new recording by The Dufay Collective directed by William Lyons. This 2008 release is well worth buying. But with an British ensemble and British director recorded with choristers from an English minster (Southwell) why is the Harmonia Mundi disc prominently branded Production USA? * I knew of Noah Greenberg from The Play of Daniel and his other recordings. But this path had its genesis when I visited Prades in 2010 on the path of Pablo Casals. Outside Prades is the Abbey of Saint-Michel-de-Cuxa where Casals performed many times. Substantial parts of the Abbey cloisters were purchased by the American sculptor George Gray Barnard in the 1930s and shipped to New York to become the centrepiece of The Cloisters where The Play of Daniel was premiered. Photos and more on that path here. A wonderful profile. Thanks very much. The American Musicological Society has long had an award named after Greenberg. One error: Martin Luther Kind was assassinated in 1968, not 1965. Thanks so much for this. Never knew much more than he died way too soon. The Elizabethan book he did with Auden has been a treasured resource for me since the 60's, and about ten years ago got a copy of his Early Renaissance Music. Have made arrangements of various pieces for small chamber groups from both, and people really like them. Being an outsider to the classical music establishment myself, that he was an autodidact comes as delightful news. Dexter, thanks for that. The spurious reference to the assassination of Martin Luther King was my error entirely and the wording has now been deleted from the post. Thank you for this. The New York Pro Musica's recordings were staples of my teenage-hood. I wore out my copies of their collection of Monteverdi Madrigals, and their Petrucci: First Printer of Music LPs (which I wish could be reissued on CD). Re Lyle Sanford's comment above "that [Noah Greenberg] was an autodidact comes as delightful news". I doubt there is anything particularly sinister about the Production USA tag as you seem to suggest. The genesis and production of this recording probably originated from Harmonia Mundi's California office and Robina Young rather than from the office in Arles. HM does not maintain a seperate UK office and production center so all of their recordings originate from either Arles or California. With regard to his neglect I suspect that had he lived and worked longer the advantages that later ensembles enjoyed, better instruments, more research and knowledge of the music being performed would have shown in performances that do the music more justice. David Munrow's career didn't really start until 1966 when he and Christopher Hogwood started putting together the band that would become the Early Music Consort and sadly his career only lasted another 10 years. Robin, it depends what is meant by doing "the music more justice". 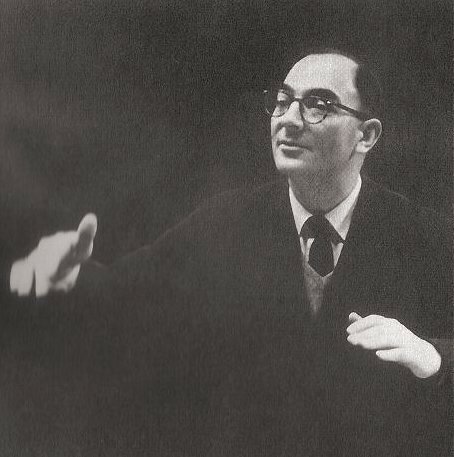 One view is that the connection that Noah Greenberg made with his audience during his lifetime showed that he was doing the music more than justice. Another reader wrote in an email to me "The Play of Daniel with the Play of Herod was still issued when we purchased our copy many years ago. Being woefully ignorant of the music, we wanted to listen to the whole thing as we were planning a performance. It is glorious and alive. Would it be performed in the same way in this age of historically accurate performance?" Glorious and alive - that is fine by me and by many others I think. The collaboration of Greenberg and W.H. Auden in An Evening of Elizabethan Music is a delight both for the music and for the poetry/prose readings. That it is not now available as a CD is a scandal, as is the unavailability of the other mentioned musical LPs by Greenberg and his musicians. Are there copyright problems? I loaned out my copy of the Auden readings and the accompanying music to someone who did not return them. To my vast regret.